They are the eighth graders that make me laugh often, think deeply, and pour myself into my career. I really love them! Now, 3 years into teaching 8th grade, I finally feel like I have my footing with them, the content, and the learning styles and uniqueness that comes from 13-14 year olds. 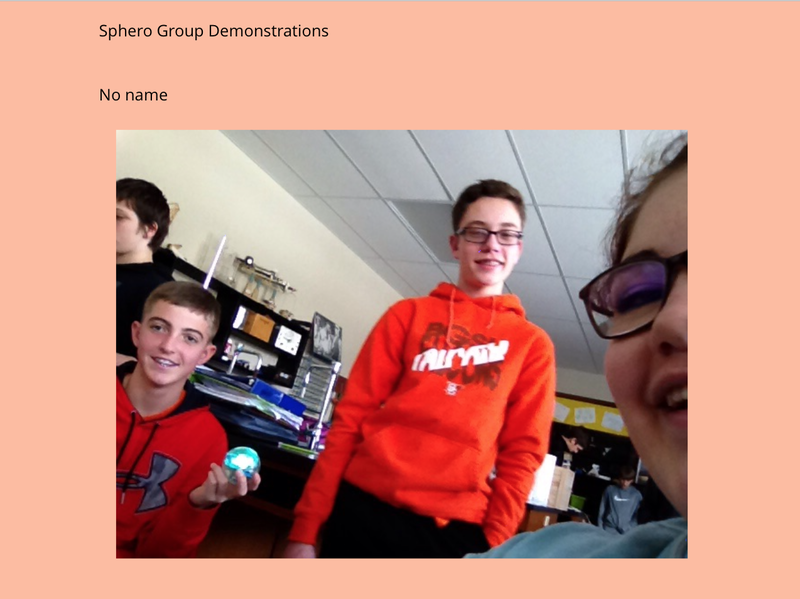 My Ohio Standards have a marvelous section for 8th grade scientists that allow them to explore Forces and Motion. From the unseen to contact forces, there is some fun curriculum to work with. 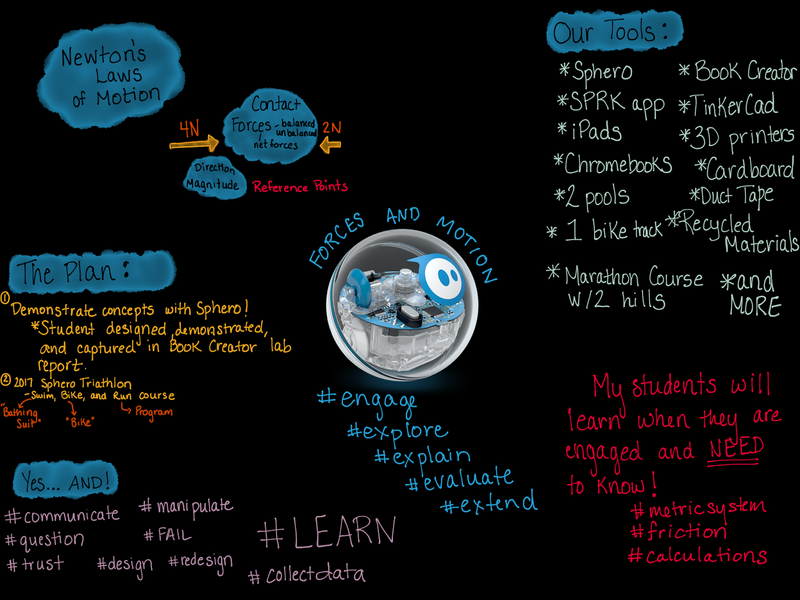 My Sphero Physics Fun had a phenomenal start this week! 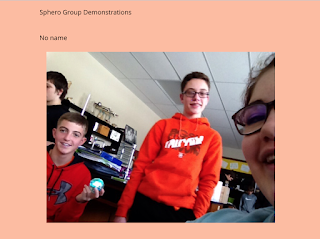 Student groups began by creating a Book Creator lab report in which they used Sphero to demonstrate some of the basic concepts for Forces and Motion. From Newton's Laws to vocabulary associated with forces and motion, these kids were creative. They captured footage, used slow motion, and built some amazing lab reports. It was pretty cool to see them working together, talking science, and working with the concepts. While some students still struggled with the content, I could definitely see progress. We were building #sciencecommunication skills the entire time, and that is a win! My next step was to give students a competitive experience like Kaci Heins does at Space Center Houston! She inspired me with her Sphero activities. I decided to challenge my students to a triathlon! The athlete...Sphero. The training...programming and driving. The engineering challenge...design a bathing suit and bike for the first two legs of the triathlon. The purpose...fun and more science! So, I "rolled" the project out to students with this SLIDE SHOW. We have 2 pools for the first leg of the triathlon built with pond liners and LEGO tables (Familiar? Day 1 was used for student brainstorming, planning, and measuring. Days 2 and 3 were ALL about building, testing, 3D printing, redesigning, programming, talking, FAILING, and more! Why did I love teaching this week SO much? I didn't introduce the formulas for speed...until the students asked. I didn't remind students to use the metric system...until TinkerCad software and Sphero tape forced them to. I didn't ask the students to memorize the different types of friction...they were asking about them on their own! Sliding friction, rolling friction, static friction...we were chatting all day long about them. Do we want to minimize friction? Should we try to increase this force? How is it helpful? How does it hurt? I wasn't forcing students to look at random diagrams of forces...we were mapping out the forces together to represent Sphero's motion. Playing to learn isn't a new concept. I'm not doing anything special. 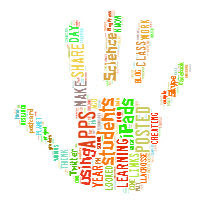 I'm just following instinct, other amazing educators, and using some amazing tools! I love teaching. I love my students. And, I love learning and growing.